Never Magic Fish 4 before? Take a deep breath and dive into the underwater world in Magic Fish 4 — deep dive travell under the sea ! Engage in challenging and fun Fish-catch gameplay with unique twists as you build your own sea pond,sea mine ,research center,beauty to create cozy homes for lovely fish.PLAY IT NOW. ● Unique gameplay: sea pond,sea mine ,research center,beaut,update your building —all in one place! ● Explore an exciting aquatic world with your own pond,mine,research center, beauty center. Please note! 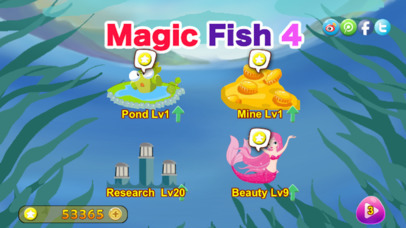 Magic Fish 4 : Deep Dive is free to play, though some in-game items can also be purchased for real money.